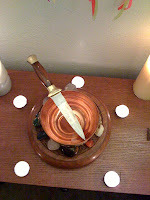 Inciting A Riot: Beltane Blessings! 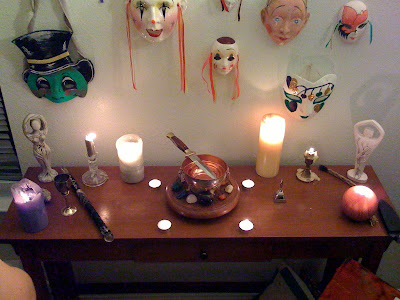 Last night we celebrated Beltane with a small ritual. Again, it wasn't anything fancy. Oddly enough, I didn't feel as connected with the power of Beltane as I did at Ostara. I don't know why that is. More than likely it is because the ritual was a little rushed and hodgepodge. I didn't have a proper chalice (I'm in the market for a new one), and my new cauldron had to be substituted. The blade didn't fit, and it kept falling out. Really, like I said, it was just kind of a thrown together ritual. It still felt good, though. Abel was involved, though he did say he didn't quite understand what was going on. I'm hoping that as the years progress, and these rituals continue to be a part of our lives, these holidays will come to mean something to him as well. Anyways, I hope that all of you had a safe and wonderful Beltane! I'm sure there was much revelry around a balefire last night, but I hope that there was plenty of worship as well. The move is in a week and a half, and graduation is in exactly a week. Things are moving so quickly! Soon enough, we'll be living it up in Chicago! Thank you all for your support and well-wishes. Blessed Beltane!